Good evening! 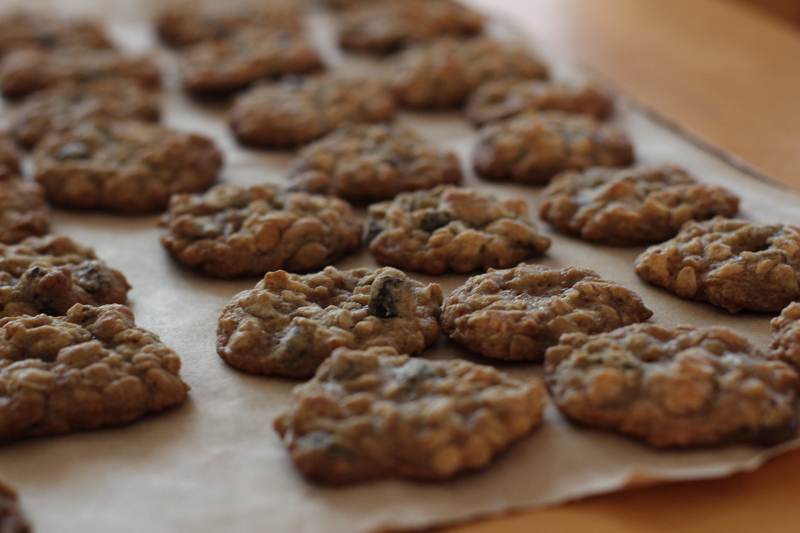 Tonight seems like an oatmeal raisin cookie kind of night. That’s why I’m going to post my mom’s favorite oatmeal raisin cookie recipe. Oatmeal raisin cookies are her favorite kind of cookie, and she’s never found a recipe that can beat this one. It’s just that good! This is the recipe that used to appear on the cartons of Quaker’s oatmeal. I believe that the recipe on the cartons is now a little different and not quite as good. I retyped the directions in my own words, but the recipe as a whole is the same. I know I’m posting this recipe in the summer, but if you ever want to make cookies that embody fall, I would suggest making these. The earthiness of the oats, the sweetness of the raisins, and the spiciness of the cinnamon brings to me flashes of crisp air, vibrant leaves crunching underfoot, and wood smoke in the air. Preheat your oven to 350˚ F. Cream the butter and sugars together. Add the eggs and vanilla and mix. In a medium bowl, whisk together the flour, baking soda, cinnamon, and salt. Dump the dry ingredients into the wet and mix until just combined. Mix in the oats and raisins. Optional: Chill the bowl of dough, covered in plastic wrap, for thirty minutes before baking. Line cookie sheets with parchment paper and place balls or spoonfuls of dough onto the sheets. Bake for about eight minutes (It may be more or less depending on the size of your cookies and also on your oven) or until the cookies are a lovely golden brown. Posted on July 30, 2013 by rjoy19	• This entry was posted in Cookies, Cookies and tagged Fall Cookies, Oatmeal Raisin Cookies, Quaker Oats, Quaker's Vanishing Oatmeal Raisin Cookies, Warm Cinnamon, Yummy. Bookmark the permalink.